The treatment of any disorder of respiratory system should be started with action upon the large intestine. Cleansing enema is obligatory to provide quick and effective recovery. It should be noted that such procedure is desirable for any kind of treatment, and SCENAR as well, especially for treatment of respiratory disorders. The patient should provide appropriate conditions for respiratory organs — the walks in the fresh air are obligatory. 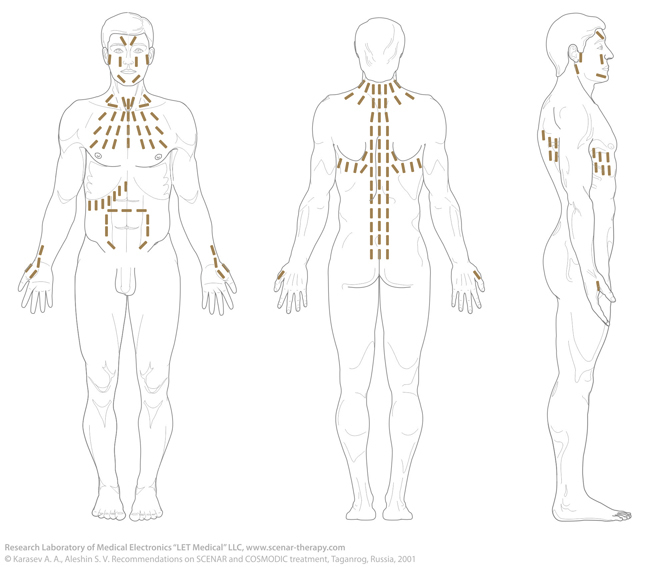 Attack condition Jugular area 2–5 minutes → middle chest 2–5 minutes → C7 2–5 minutes → “herring-bone” pattern until the attack is eliminated → abdomen → 6 points → 3 tracks (especially in adrenal glands region) “Herring-bone” pattern — only after the patient starts feeling better, energy should be as much as tolerable, symmetric areas should be acted upon simultaneously q. s. until the attack is eliminated.